There are many many great blog posts reviewing mLearnCon last week. Several mind maps, videos, and other media as well. So I don't feel the need to do a high level recap. Instead, I'd like to take another look at one of the questions asked of the closing panel. I don't remember the exact question but basically someone wanted to know about the "first thing" you should do to get started with mobile learning. I think it's a great question and I think it deserves more than a couple 30 second responses. I think it's important because "where do I start" is a question asked of any new model, modality, technique, or technology. And while I liked the answers that were given by the panel, I think they require more analysis. Or more to the point, i think the answers only raised more questions...at least for me. "You must first understand if mobile learning is even an appropriate solution before you decide what the first step will be." I agree with the statement, but would then argue that seeking understanding IS the first step. But nobody really knows how to make that decision, and gain that understanding. Similarly, how can an organization define what mobile learning is, or will be, in their environment without first trying out some mobile learning? "What does an organization actually look like that is ready for mobile learning?" I ask this question because if we are to start with discovering if our organizations are ready for it, then I want to know what that state looks like. If this state of an organization is even definable, then I'd like to compare that to the companies that have implemented mobile learning to validate if they were, in fact, "ready" to take that first step and do that "first thing"...whatever that first thing may be. So, I ask you to comment here and let's extend this conversation. Hopefully we can nail this down and then share it back into the community. Thanks for responding Ara! If you have time to respond again please help me with this discussion and tell me what you see common amongst the learning strategies you've seen. And if you can, share with us what their first steps were...or may have been. While some companies see the end-user phenomena as you and I see it, but others remain skeptical and don't know where to start. Maybe the answer lies in the IT departments? Perhaps organizations that are implementing mLearning strategies now also have forward thinking IT departments. Maybe that's the common link? I'd love to hear more. Thanks! Been thinking a lot about how to leverage technology for learning and support, so will edit some prior work. 1/We are setting out to do something in particular, not everything. 2/We know what we want the message to be, how we want them to handle it, how we would prefer that they not. 3/What we give them will demonstrate obvious and immediate value because it helps them do something they care to do. 4/We provide ways for them to talk to each other and to experts as they turn to their devices and this app. 5/We have analyzed how they feel about this matter and mobile learning and support and have taken questions and concerns into account. 6/We will help our people to explore these resources and grow comfortable with this more immediate, independent and connnected way of learning. 7/They have access to the necessary technology. 8/We have thought hard about where and how they will use this and anticipated and mitigated glitches. 9/Their managers know what we are doing and why. 10/Their managers are keen on this direction. 11/We will help them by providing what is necessary to be successful, from on boarding programs, to information on demand and human support too. 12/We will track their use and how they are doing and help them do better. 13/As we contemplate mobile learning VS support, we are making conscious decisions about what they must know by heart and what can be referenced at the moment of need. 14/We constantly ask ourselves about the value of what we are delivering, both the ends and the means, and promise to remain humble about these ideas and technologies. 15/We know that learning,support and community on-the-go make sense here, not just because I think it's groovy. See, only 15 things to think about. wow! Allison, that is great! I hadn't thought about answering my own question this way. But as I read your list of 15, I can see how answering "yes" would, in fact, make me feel comfortable moving forward with a mobile learning initiative. This is extremely helpful to me as I have been seeking something practical to cling too regarding these big questions. Not sure I love the question. I think it may be the wrong question simply because its not organizations that get ready for 'mobile learning' its people. The way I see it, is that every organization is ready for it because the people inside an organization for the most part are doing it without calling it 'mobile learning'. Herein lies part of the work ahead, which is to determine what parts of the 'mobile learning process' within an organization (mostly self organized among people) should the "organization" (organizational infrastructure) involve itself in. Its kinda like a right wing, left wing thing where on one side you want the government to stay out of it and on the other you feel like the organization needs to get involved for the public good. That to me is the bigger question because ignoring the pervasiveness, ubiquity and power of mobile technologies as an effective and efficient means to provide meaningful, valuable content to employees is simply asinine. The question (or set of questions) is "When should an organization control mobile learning" and "What are the best practices for introducing organizational control over mobile learning". Tozer makes an interesting point about the individual vs the organization. I was spinning off enterprise initiatives. Consider the university that is nudging its faculty to use mobile in their courses to extend lessons beyond the classroom. That's one instance. 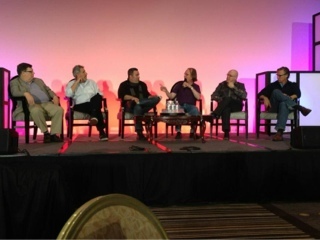 I was also thinking about several organizations I know who are integrating mobile into seller learning and support. Another example is a project I worked on recently: mobile for leader development. Those are enterprises setting out to do something via mobile. Are they doing all they might to make that resource work for their people and their organization? That's what the above list responds to. Tozer, I think you are right. And I think we are all on the same page regarding the individual vs the enterprise. Mobile devices are not going away and individuals are more and more, learning how to use their devices to improve themselves, and as support for everything they do. And it's because of this that it's time for the enterprise to get involved. And NOT to control but to take advantage of this opportunity. So as a training department, how can you take advantage of individuals having and using mobile devices all day long...and not just at work. Even though your individual users MAY be ready your IT dept, HR dept, etc may not be. There is a lot to consider. Not that I'm a "mobile learning thought leader", but I tend to think of it as a situation that calls for mobile learning... of which the people are a part, and the organization gives context. So I guess my answer to the question is that the organization that is ready to consider mobile is the one that realizes that they have a specific need for which mobile is a good solution. I see way too many people asking questions like "we have iPhones; what should I do with them?" and way too many vendors pushing the ability to publish courses to mobile devices. One is a solution looking for a problem and one is just solution looking for a paycheck. To me, an appropriate prompt to consider mobile looks something like "our repairpeople need to access a wide range of procedures and a huge product catalog from the field". I'm happy to be wrong, though. Good discussion! Dude. Having a discussion on Blogger is such a PITA. We need to do something about this, kind sir. Your question was, "What does an organization actually look like that is ready for mobile learning?". There is no answer to this that I'm aware of. I think the more open the organization is, and the more responsive it is to its employees' needs, the more "ready" it might be. Maybe if an org is already moving away from the old standard of LMS and courses? Other than that, I don't see any standard look and feel of readiness for mobile learning. The more important question, as Tozer and you both discuss, is, how can an organization support, learn from and take advantage of what people are already doing? When should they jump in? What does that look like? I'd love to hear what Chad Udell and Clark Quinn, amongst others, think about this (I'll ping them on Twitter) from their experiences. Well, since Brian personally implored me. I think Allison's got a lot of it right, naturally. Tozer btw = Reuben. Dont know why my account is showing as Tozer. Hi Brian! I know, I know. Blogs are so 2000's! However I do like how everyone's input sits here in a nice little archive that I can come back too and reference. Everyone's comments have each sparked ideas for additional blog posts. It's a great conversation. And to your point, I think its a very hard question to answer as well which is why I asked it. I actually hear this question asked a lot, in one form or another. But basically, it feels like people are looking for "first steps" to help them, and their org "do" mobile learning. As easy as it might sound to some, others are struggling with their unique situations. So, I'm hoping this conversation can shed some light onto a few solutions that may just be the catalyst for some to get started. And yes, I'd love to hear from Chad and Clark! Hi Judy! I didn't refresh my browser and missed your comment. Sorry about that. But yes, I completely agree. I think there are some instances that just beg for a mobile solution. But this is where the conversation gets complicated because some will argue that your example is performance support and NOT actually mobile learning. And that's the argument I'm trying to avoid. But maybe we need to have it. Clark, that's a nice list to go along with Allison's. Thank you for sharing. Do you need to wait to be "ready for m-learning" before you can start? One of the things that always worry me in discussions about m-learning are absolutes. The reality is what works in one situation might not work in another. Which makes it hard to be absolute about when an org is ready for it. Maybe a slightly lateral take on the question would be to ask how far individual employees / learners can get with m-learning on their own ... BEFORE the company steps in and rolls out an official adoption? Or how much NEW stuff could you do with mobile, rather than replicating what is already happening. 1. It/connectivity: IT organization must be open to multiple devices, as the key driver of mobility usually rests in end user's personal mobile devices. Increasingly, IT leaders must be in the bis niceness of facilitating connectivity versus prescribing IT standards. 2. Content usability: it is critical to develop content with the ability for such content to properly display in multiple mobile OS'. Furthermore, content must be reduced into "nano drinks" of information and knowledge - because the intended end users are usually on-the-go, and they are not looking for training - they seek answers. 3. Audience: At first, it is best to chose the audience that is likely to provide the path of least resistance. Don't try to push mobility on audiences that resist it. Go where the use of mobility is inherent to the role and the generation you will serve - such as sales staff. Sorry for being short. Got to catch a train to Brussels. 1. It/connectivity: IT organization must be open to multiple devices, as the key driver of mobility usually rests in end user's personal mobile devices. Increasingly, IT leaders must be in the business of facilitating connectivity versus prescribing IT standards. Hi Geoff! There are very few absolutes in any aspect of eLearning yet people are always looking for them. My guess is that the people asking the questions and looking for someone else to give them an absolute, really just don't understand their own organization well enough yet. Three great points! I concur. You're very right about how beneficial eLearning is, especially mobile eLearning. I agree 100%. If you ever are looking for an eLearning Management System, us at Cogentys Coorporation are here to do that for you! We specialize in custom eLearning training programs that cater to your business's needs!